All timber needs to be weathered before you stain it. Darker coloured timbers or gum timbers in particular need to be left for about 4-6 weeks, so the excess tannin and gum can leach out. We have a variety of products to expedite this process, such as Wax, Oil, & Tannin Remover or Chlorite. We recommend diluting them 3:1 with water and washing down the timber. Lots of tannin and resin should wash out. It's worth scrubbing the deck to help drag out the deeper tannin and resin. Once you're happy with what's been removed, rinse the deck off with fresh water and allow to dry. To avoid cupping and flexing of timber, apply at least 1 coat to all sides of the timber. Depending on your preference, apply 2 coats of Oil Acrylic, Deck ‘n Trim or Rich Wood Oil to the decking. Allow 8 hours between coats for Oil Acrylic, 4 hours for Deck ‘n Trim, and 24 - 48 hours for Rich Wood Oil, though if possible, 1 week or more between coats is ideal. A colour will always out perform a clear as pigment will scatter UV light. 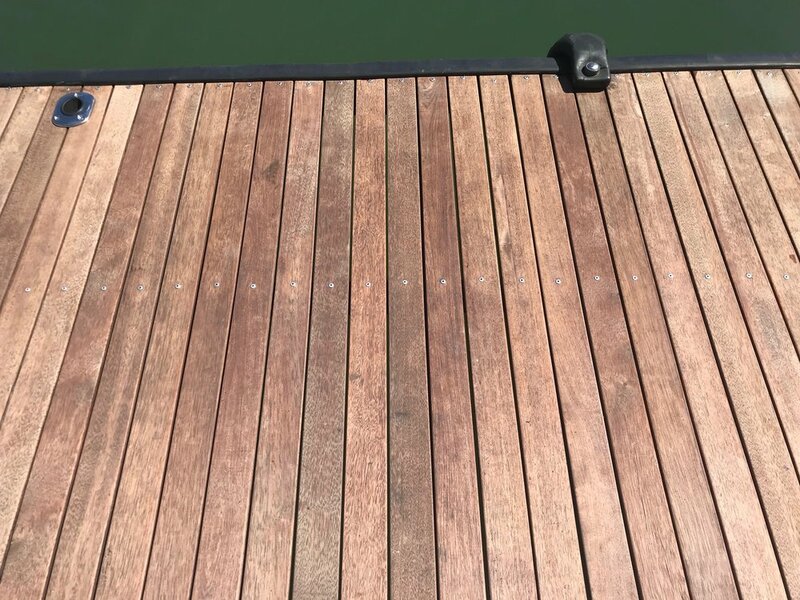 Another option for a weathered grey decking that is well protected is to follow the above steps, but apply 2 coats of Controlled Erosion Stain. Follow this up with a coat of Outdoor Furniture Oil or Rich Wood Oil, the former being better for a matte lustre level, the latter for better protection is moisture or splash rich areas. A deck finished with Deck n’ Trim. 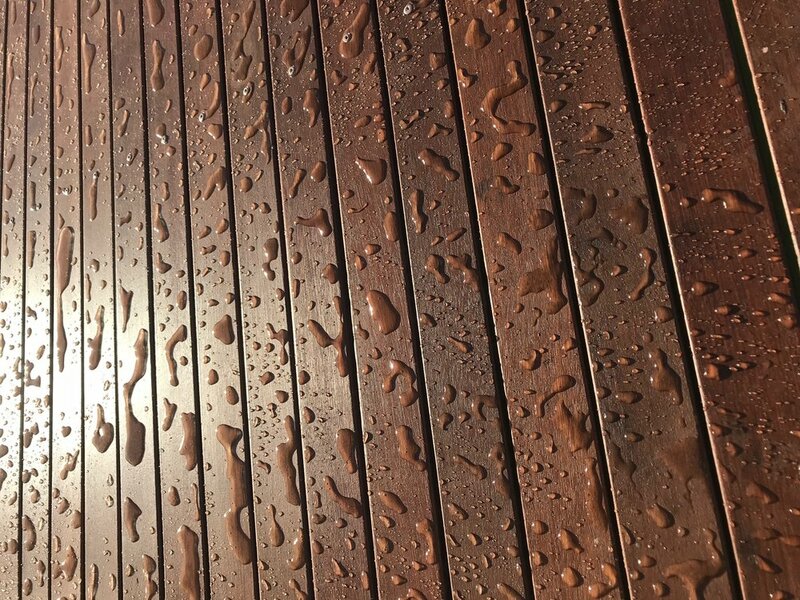 Deck n’ Trim showing its water repellency. If the deck or furniture is irregular in colour, with black and grey patches, it's best to use Grey Away or Grimes & Sons Timber Bleach. It should disinfect the timber and balance the colours. Soak for 5 minutes, scrub with a stiff bristled brush, then rinse with water. Soiled material should wash straight off, and try to avoid getting it on plants. Reapply with existing coating system. Precoat the raw or most weathered areas first. Apply heavier coats there, and thinner coats on the sheltered, protected areas.